As with the band’s previous six releases songs rarely stay on any one track for long, the title track being a prime example – once you’ve got the hang of the off-beat reggae groove with its memorable guitar refrain ‘Tea Time For Punks’ then takes a completely different road and races off with a jazz swing which gets heavier as it cruises along: sounds offbeat, maybe, but it works, largely because the songs are imaginative and finely-crafted, and also because the players are all masters of their craft. Guitarist Christophe Godin is hugely respected for his virtuosity outside of the band anyway, and bassist Ivan Rougny and drummer Aurel [Aurelian Ouzoulias] certainly know how to bring the best out of their respective instruments. Across the album the heavier material should satisfy any metal fan, although the target audience is more the likes of aficionados of Joe Satriani – it’s not really music to bounce around the room to (although please don’t let me stop you), more music to savour and mentally dissect: ‘Untoon That Geetar’ and ‘Tree Ball’ are prime examples while ‘Far Tea Time’ is more straight down the line. Humour is injected via off-beat titles like the aforementioned ‘Far Tea Time’ and the effervescent ‘God Shaves The Queen’, jaunty ditties like ‘Mariachi’s Burger’ (with its ‘Ace Of Spades’ and coughing fit vocal interlude, and, naturally, mariachi break) and the off-key rendition of ‘Yellow Submarine’ at the tail end of ‘Rood’, and you’ll either get it or hate it, depending on your point of view and your musical parameters. On the downside though, if you were browsing in a record shop – if such things still exist these days? 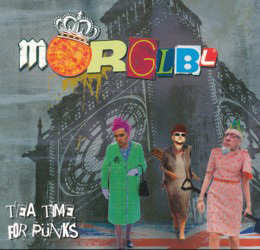 – unaware of what Morglbl have to offer, the cross-dressing collage cover seemingly executed by a four-year-old would not exactly leap out and shout ‘buy me!’. And thereby sits the conundrum. Godin, Rougny and Aurel all-too-evidently know what they’re doing and are happy with it, but most music fans will indeed judge a book by its cover and not be enticed by the band’s artwork. Which is a shame, because if that describes you, you’d miss out on the treats that lie within.